Why Should I Take This Class? Hypertext Markup Language (HTML) and Cascading Style Sheets (CSS) are the foundation of web development. Used together, HTML and CSS form a powerful duo that can create websites of any size, shape, or function. Our in-depth HTML5 and CSS3 classes will help you learn how to create your own professional and functional website from start to finish. Upon completion of our HTML and CSS classes, you will possess the skills and abilities to make a successful website that will stand out from the crowd and attract visitors. 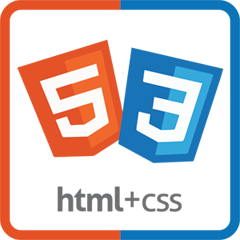 All of our hands-on HTML5 and CSS3 classes include: a professional textbook, one month of technical support, and one year for a free re-take*. Web design with HTML and CSS classes are taught in a live format. This means you will work with a live instructor and get your questions answered immediately. We are here to support you as you find your path with web design and development. Let’s get started! What Can I Create After This Class? Click a class title below to view schedules and register. Questions? Contact us at 970-980-8091. Learn how to create web content with the core languages of all web pages: HTML and CSS. © 2019 Digital Workshop Center. All Rights Reserved.